The Kindness Rock movement is taking over worldwide! 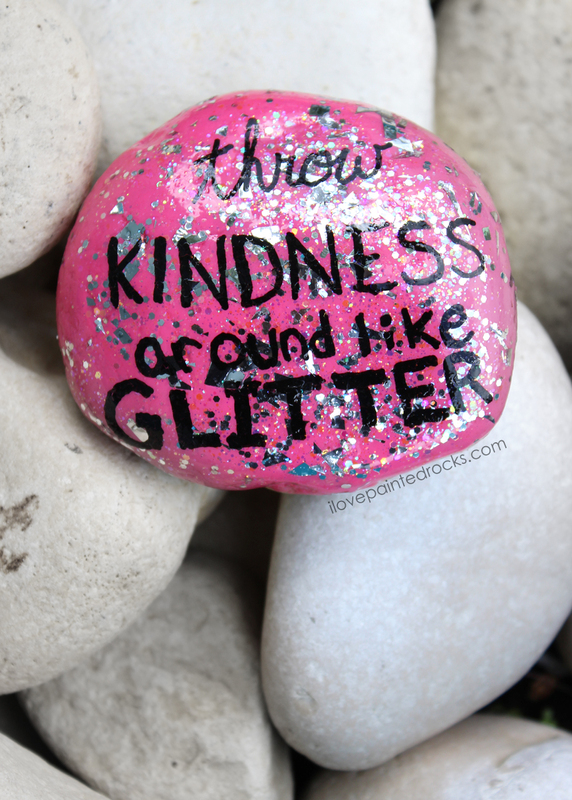 People from around the globe are painting encouraging words on rocks and leaving them in public places for people to find (learn more about how to play the kindness rock game here). 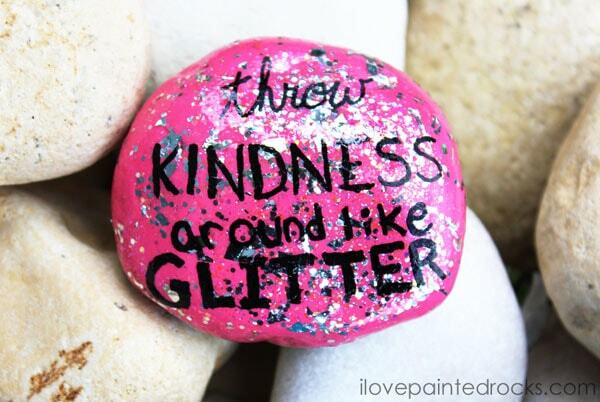 If you have never made a painted rock before, making a kindness rock might feel intimidating. Don't worry! I'm here to help you. You can use this same rock painting technique to write anything at all on a rock. The glitter paint is totally optional as well (although I particularly love glitter rocks!). "throw kindness around like glitter"
Keep in mind that this is a sped-up video so it does NOT show drying time. You MUST let the rock dry between steps (you can even use a blow dryer if you are impatient) or your rock will not turn out properly. Use the the Pink Dahlia Martha Stewart Multi-Surface acrylic paint to create a basecoat on your rock. If the paint has thin or streaky spots, allow the rock to dry (you could even use a blow dryer) and do a second coat. Allow to dry. Once the base coat is dry, add a generous coat of Glitterific paint. I've played with several colors of this and they are all lovely. I used silver for my demo rock. Allow to dry completely. When I do lettering on rocks, I like to write out what I want to say first. That way I can determine which letters should be in the middle and then I work from the center, outward. I used an Ultra Fine Uni-Posca Paint Pen to do the lettering. Unlike a Sharpie, it won't bleed when sealed and will stay colorfast and last a long time. If you plan to place this rock outside or hide it as part of the kindness rocks or hide and seek rocks game, it's super important that you seal your rock. This keeps the writing from rubbing off and since this rock has glitter, I like to add THREE coats of sealer. It's important that if you leave rocks in public that nothing attached to your rock is capable of coming off. Using three coats of sealer makes sure that the glitter will stay permanently attached to your rock for years to come! This is my favorite weather proof rock sealer. Get more tips about how to seal painted rocks here. If you love this rock painting idea, don't forget to share it!